With only an estimated 12,000 cheetahs left in the wild, this highly endangered carnivore is facing an uphill battle in its struggle to survive. It is highly persecuted by local formers who blame it for livestock losses, often mistakenly so. In addition, cheetahs are regular victims to lion and hyena attacks and are in turn forced off of protected reserves where those predators thrive. Though it is the fastest land animal on earth, it may not be fast enough to escape extinction without the help of strong conservation programs designed to protect it. Zoo Miami incorporates a strong “Animal Ambassador” program as part of its overall educational mission. Using the cheetah as the flagship animal for that program creates an indelible impression on countless individuals regarding the need to protect and appreciate our world’s wildlife. There is an old saying which states that, “In the end, we protect what we love, we love what we understand, and we understand what we are taught.” The Cheetah Ambassador Program is able to teach in a way that leads to a better understanding of this wonderful cat while hopefully producing a profound sense of caring. In 1998, Zoo Miami partnered with the DeWildt Cheetah Center in South Africa to acquire a female captive born cheetah named, “Savannah.” She became the founding member of the Cheetah Ambassador Program and traveled around the United States educating millions of individuals through personal presentations as well as national and international television appearances. She was joined a year later by “King George,” a rare King cheetah and together they raised tens of thousands of dollars for cheetah conservation efforts throughout Southern Africa. That money has supported a variety of programs as well as providing for thousands of dollars in veterinary equipment and supplies for the ongoing studies of cheetahs in the wild. Though we lost Savannah in 2012 at the very advanced age of 15, and King George has since retired from making public appearances, the legacy of the program continues with the addition of “Diesel” and “Koda,” two male cubs that were captive born at the Ann van Dyk Cheetah Center (formerly DeWildt) in 2012 and are now the new ambassadors of the program. 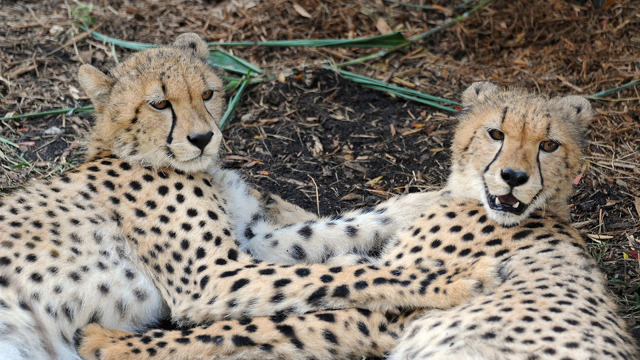 Through the awareness raised by these two beautiful animals, Zoo Miami continues to provide support to cheetah conservation programs in Africa and is committed to doing so for the foreseeable future.